I guess there's really no point in stating again how much I think EF CF is awesome (just check this post or this post). There's a lot of magic in EF CF — and of course there are more straightforward things. Mapping entities is one of the plainer and simpler things. One person can have any number of cars and one car belongs to one person, or maybe there are cars without a person. One person can have any number of cars and one car can have more than one owners. Every person can have one or zero cars, and every car belongs to one person, or optionally, to zero people. These are the possible options (in every case the relationship is bidirectional, though; so if a car belongs to a person, than that person belongs to the car also). And that's it :) You already have your relationship set up. 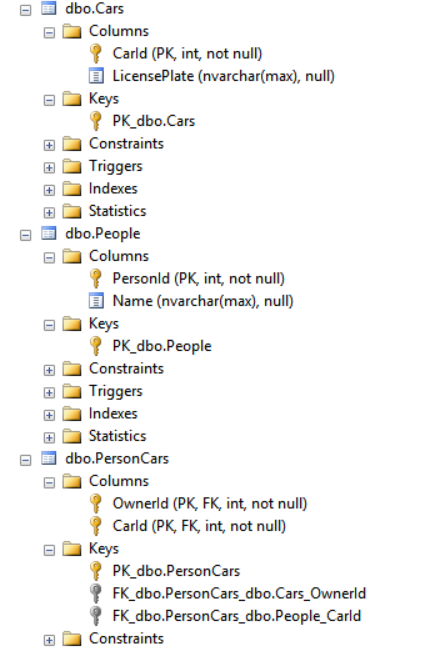 In the database, this is represented with foreign keys, of course. This model already supports a person not having a car, but it doesn't support a car without a person. To change this, simply change the type of PersonId to int?. 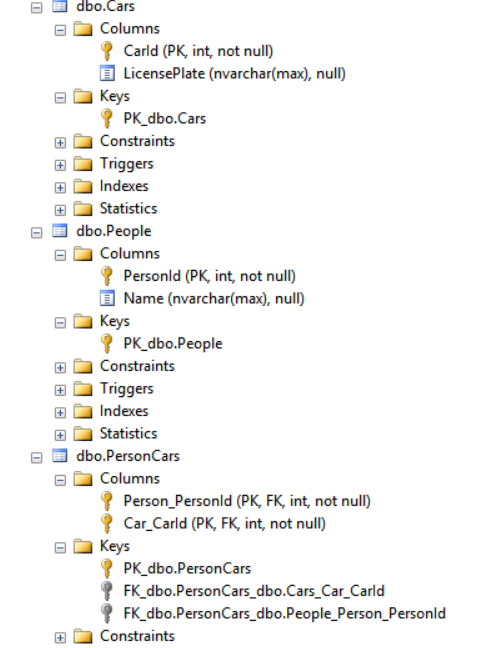 Note that the PersonId column is now nullable in the Cars table. How does EF know which column is the foreign key and where should it point to? The conventions, of course. 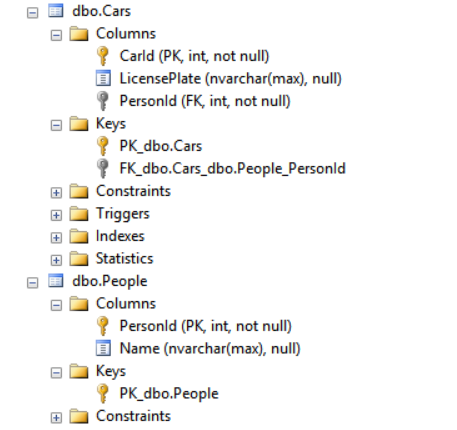 Having a property of type Person that is named Person with a PersonId property leads EF to conclude that PersonId is a foreign key, and it points to the primary key of the table represented by the type Person. But what if you were to change PersonId to OwnerId and Person to Owner in the Car type? The idea is the same, just the sides are different (note how you can read the whole thing: 'this person has many cars, each car with a required owner'). Doesn't matter if you configure the relationship from the Person side or the Car side. You can even include both, but in this case be careful to specify the same relationship on both sides! Note: if the relationship was optional on the car side, you would use HasOptional() and WithOptional(), respectively. 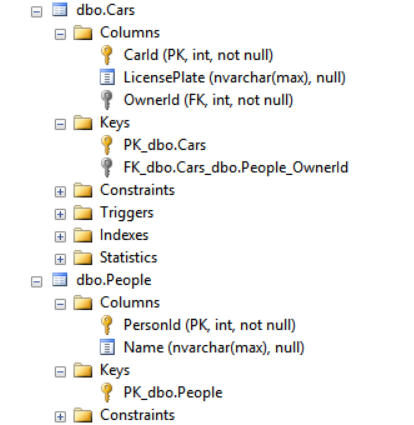 In this case be careful to specify the column of the foreign key as a nullable type! I have to admit, I'm not really a fan of this solution. 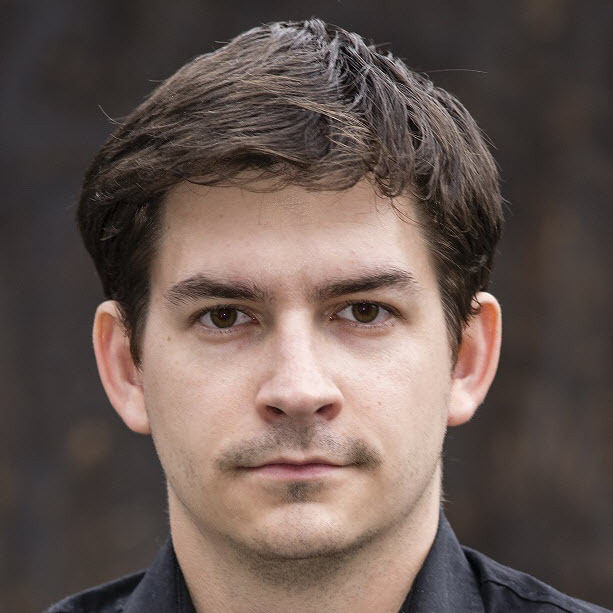 You cannot track extra information to a person-car association (let's say the date from which it is valid), because you can't modify the table. 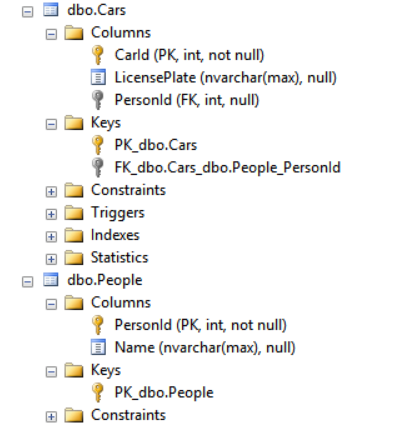 Also, the CarId in the join table is part of the primary key, so if the family buys a new car, you have to first delete the old associations and add new ones. EF hides this from you, but this means that you have to do these two operations instead of a simple update (not to mention that frequent inserts/deletes might lead to index fragmentation — good thing there is an easy fix for that). This gives me much more control and it's a lot more flexible. I can now add custom data to the association and every association has its own primary key, so I can update the car or the owner reference in them. Note that this really is just a combination of two one-to-many relationships, so you can use all the configuration options discussed above. The case when one person can be associated with one car and vice versa is called a one-to-one mapping. In this mapping, the relationship is always bidirectional: if PersonA belongs to CarA, then CarA belongs to PersonA. One-to-one mapping is probably the most interesting from a technical point of view. One side can be optional and one can be required. Let's discuss the case when one side is required and one side is optional. In our case it makes more sense for the car to be optional for the person. So this means that the CarId and PersonId properties we have in the model are basically ignored. They are in the database, but they are not foreign keys, as it might be expected. That's because one-to-one mappings does not support adding the FK into your EF model. And that's because one-to-one mappings are quite problematic in a relational database. The idea is that every person can have exactly one car, and that car can only belong to that person. Or there might be person records, which do not have cars associated with them. 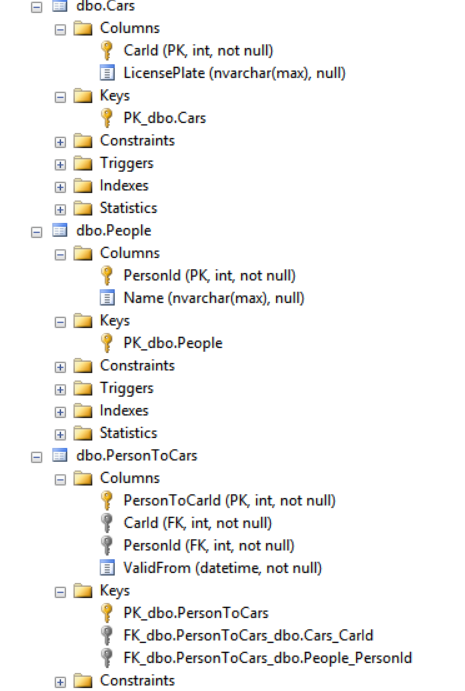 So this relationship is not enforced by the database schema, but by Entity Framework itself. That's why you have to be very careful when you use this, not to let anybody temper directly with the database. Mapping one-to-one (when both sides are required) is also a tricky thing. Let's imagine how this could be represented with foreign keys. Again, a CarId in People that refers to CarId in Car, and a PersonId in Car that refers to the PersonId in People. Now what happens if you want to insert a Car record? In order for this to succeed, there must be a PersonId in Car, because it is required. And for this PersonId to be valid, the corresponding record in People must exist. OK, so let's go ahead and insert the person record. But for this to succeed, a valid CarId must be in the person record — but that car is not inserted yet! It cannot be, because we have to insert the referred person record first. 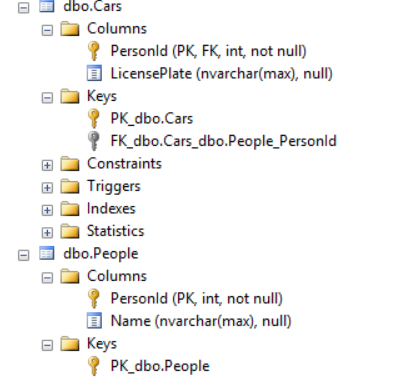 But we cannot insert the referred person record, because it refers back to the car record, so that must be inserted first (foreign key-ception :) ). So this cannot be represented the 'logical' way either. Again, you have to drop one of the foreign keys. Which one you drop is up to you. The side that is left with a foreign key is called the 'dependent', the side that is left without a foreign key is called the 'principal'. 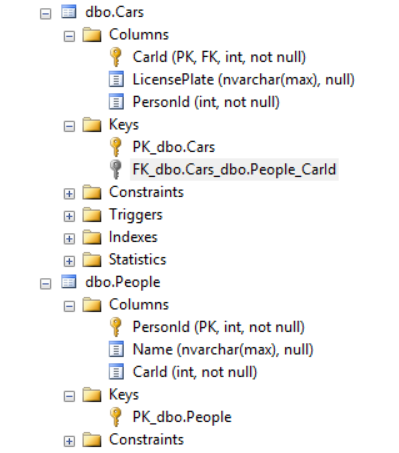 And again, to ensure the uniqueness in the dependent, the PK has to be the FK, so adding an FK column and importing that to your model is not supported. By now you really should have gotten the logic of it :) Just remember that you can choose the other side as well, just be careful to use the Dependent/Principal versions of WithRequired (and you still have to configure the PK in Car). And to finish off, let's briefly look at the case when both sides are optional. I just realized that this post has gotten way longer than I had anticipated :) So I'm not going into the details and play with the idea of having two FK-s and the potential problems and warn you about the dangers of not enforcing these rules in the schema but in just EF itself.